Come on over to TTouchworld.com and poke around my new and improved site. It’s a blog, and so much more! Starting today, all my new posts will be published at TTouchworld.com. See you there! Dec. 22,Chimfunsi: 6:00 a.m. The alarm gently breaks my dream state. One hour until the chimps go into the forest. Sheila suggested we sleep in and follow them later, but we’ve come half way around the world to find this orphanage. “I can sleep when I’m dead,” Moshe used to say. I dress a little reluctantly and wake Harriet 45 minutes later. What about breakfast? “Oh” she says, “The alarm is set on Kenyan time.” I was up at 5:00 a.m.! Back into bed I climb for a short return to dreamtime. 6:45 a.m.,Zambian time, this time! Tracy and I make cheese and toast sandwiches. Add a coveted Swiss chocolate bar, hoarded until this moment. 7:05 a.m. Everyone–Sheila, David, Harriet, Tracy, Mark, Patrick and I, hoist a clinging chimp onto our hip and parade down the road into the woods. Here, all 9 chimps are set down and the adventure begins. Each day they venture into the forest for 7 hours for walks and just to scatter about, sit in the trees, relax, eat fruit and learn. Rita wants to hold my hand and tries to convince me to pick her up. But she needs the exercise. Her 30+ pounds are a lot to pack on my hip. Chimps gallop along behind Patrick, spread out on both sides of the trail, 14 humans mixed between. They drink out of mushrooms 9 inches across, then knock them over and gallop on. Up a tree goes Coco to bring down a mouthful of orange nuts, fruit inside. Sandy, Tara, Rita, Cora, Boo Boo, Tobas, Donna, Coco. Donna discovers a piece of burlap sack and a chase ensues. Up and down trees, over stumps, diving between close branches. “Watch out!” Tobas’ trick is to swing a branch on someone’s head. We stop for a break after 30 minutes of walking. Some youngsters climb up a nearby ant hill and into the branches of the tree on top. Sandy hangs out with Harriet who works on his ears to help his cold. My camera comes out and I start the fun of photographing cavorting chimps. Donna suddenly swings by and grabs our back pack which is lying against a log upon which Tracy is sitting. Tracy yells at her and makes a lunge for the pack as it is being zipped away. Tobra reacts to protect Donna by biting Tracy on the calf. Patrick leaps up and yells at him. Up the ant hill he tears. Tracy is in considerable pain. Two blue holes appear. The skin is severed over these two tooth marks, but it is not bleeding externally. Her calf is in spasm. I start TTouch, working first about six inches all around. Within 15 minutes the pain is reduced by at least half, and the wound is shrinking before our eyes. Thirty minutes later the tooth marks have disappeared and there is absolutely no discomfort! We continue on our way through the woods. I just love getting emails like the one below. It is gratifying in the extreme to know that I have the tools to help someone facing a difficult situation. I know your are very busy but I still will send this. I have started TTouch on my horse about 6 weeks ago. He is a 17 hand Warmblood, turning 7 years in April. He had a bad start in Germany. I have reason to believe he was pushed hard as a 4 year old and tore some muscles in the semimembranosis area..down the back of the hind leg. I doubt if he was given proper care but just turned out..probably lame. He is hot blooded and reactive and I have had one bad accident with him…rearing and bucking left me with a smashed face and broken wrist. He was coming back from stall rest after an injury to his annular ligament right after I got him home from Germany. He was 5 yrs. old at that time and not well broke. I didn’t know him very well. After a year of work he is getting better and better in mind and body and your exercises have really helped. The mouth exercises did wonders to his reaction to the bit. It was amazing. My problem is that he is easy to load in the trailer but once in there he gets very impatient and paws constantly as we go forward. He throws his head around and rocks the trailer back and forth. He will be in a sweat when we arrive at our destination. I have trailered out once a week for several months and tried going on short trips every day but he still continues to get stressed. I do put him on ranitidine (Zantac) to protect his stomach when going to a lesson. The trip to the lesson is only 20 minutes and I do not take the freeway because he really hates the sound of the traffic. I need to be able to trailer this horse and I am afraid he is going to eventually hurt himself. Any ideas how I can improve this situation? To refresh your memory of the first installment of my Zambia Chimanzee Chronicles, read this post. The chimps have met us gently, taking our hands on theirs. Sandy, one of the 14-year-o1ds, has a cold. I work on his ears and he hugs the wire and sticks his ear out to me. Cooo reaches out and grabs the money out of my pocket. Sheila rescues it just in time. From 5-6 p.m. is the time the chimps try to break out, so David must go carefully around all the cages checking the wire. We make a tour of the 7 acre enclosure. An enormous wall surrounds it, 15 feet tall with electric wire planned for the top. There will be a lower strand of electric wire at 5 feet. The resourceful chimps will most likely break off branches and lean them against the wall to scale it. David feels that they should know the wire is electrified before they get up to 15 feet, touch it and fall back so far. Only the gate remains to be finished, and the roof of the cement holding areas, and the wire around the top. David figures another 2 months. The area is heavily wooded and grassed. We sit around the outside table in the twilight discussing TTouch and TTeam. Sheila treats all the Zambians in the ranch compound (village) and is very interested in TTouch. 8:30 p.m. Darkness descends. The 9/10th full moon lights the African night. We go into the house for dinner of boiled potatoes, stew, squash and mixed veggies. And directly after, fall into bed. The generator is turned off and we wash up by the light of the kerosene lanterns. Our rooms don’t have mosquito nets. I learn the next day that malaria-carrying mozzies don’t buzz and don’t leave an itchy spot. Who knows if we’ve been bitten or not. Within the first week that Tracy arrived with Mark from England, she contracted malaria. Tracy had only been on anti-malaria tablets for a week. Same with me. Tracy’s malaria started with intense fever and dizziness. It lasted about a day, which she spent mostly sleeping and returned lightly a week later with weakness. David and Sheila get malaria frequently in spite of 16 years of anti-malaria tablets. 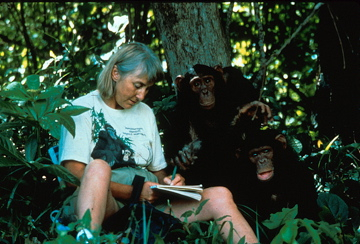 I have been communicating with Debra Rosenman, a certified Rubenfeld Synergist, and Jessica O’Donoghue, an animal behavior consultant, about my work with chimpanzees in the 1990’s. Debra and Jessica met at Kindred Spirits Animal Sanctuary in New Mexico during one of my trainings there this year, and began a conversation about Debra’s upcoming book, the Chimpanzee Chronicles. I find it so inspiring how wonderful people meet and share ideas at our trainings. Over the past 28 years since the magical circles we call Tellington TTouch have come into being, we have received countless stories from grateful people who have found that TTouch reduces fear and pain during the final stages of transition from this life to the next – the passage that Hawaiians refer to as “changing address”; and others refer to as “crossing the Rainbow Bridge”. May this poignant story of Raffael aid and support you during the transition of a beloved family member .